Happy Sunday, everybody! Running late again on our Monthly Series and for that, we apologise! In case you found yourself here, welcome! Each month, our coaches will choose one member to be featured in this series. We hope this would boost our athlete’s motivation, show our appreciation for our members and also empower our athletes to do their best in their training! For the month of January in 2019, we’ve decided to choose not only one, but two athlete! And they happened to be one of the hardworking couple to ever grace our gym! 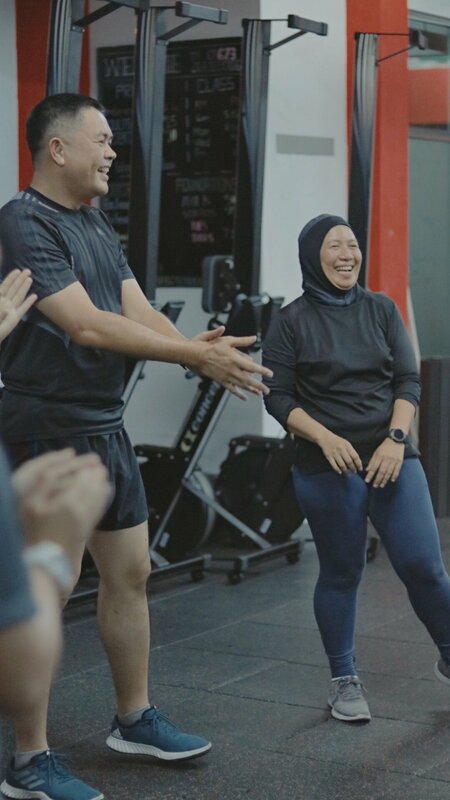 Meet Aiman and Alinah – our Bootcamp members and arguably the cutest couple in our Bootcamp class. You’ll see them almost every session doing partner workouts together, always teasing each other and always smiling. Can you say #GOALS??? Aiman and Alinah are part of armed forces and it shows in the dedication and hard work they display in all the classes. We sat down with them to tease them a little bit and bring them back down memory lane. They reminisced on younger days and when they first met while studying abroad. Fast forward to today, they have 2 lovely kids, a 12 year old daughter and a 5 year old boy. They’re fitter, better and stronger..together. Would you mind sharing about how your fitness journey was back in day? Were you always active? Well, yes! Mainly because that is the nature of our work anyway. We need to maintain our BMI and keep fit. Usually, we do our workouts and we try to keep fit. We feel like the bootcamp classes really help in that aspect. We also like that there is proper coaching in the classes. Aiman – I was a couch potato when I was younger! I didn’t do much exercise until I joined the military. I only started exercising when I joined the armed forces. Alinah – During my university years, I was quite active! I did a lot of running and swimming. When I started working, my job helped continue this routine of keeping fit. We feel like we work out a lot more nowadays, mainly also because the opportunities are a lot more accessible. During weekdays, we come to Bootcamp classes and during the weekends, we keep active together like going for hikes. How did you find our Bootcamp classes? Aiman – Clearly, I was forced to join by my wife. So, it’s thanks to her! Alinah – We found it quite a few years back actually! But we lived quite far away from here. Now that we’ve moved a lot closer, the opportunity presented itself! So I insisted that we join in the classes. We’ve been going to the Bootcamp classes for 5 months now! And we can say that it’s been quite rewarding. Alinah – I’ve lost 5 kg ever since joining Bootcamp! Aiman – And I’ve lost around 3 kg after 5 months of going to Bootcamp classes. What made you stick to our Bootcamp program? We mainly like it because of the environment and the support. We like that the classes are intimate – you have the coaches and your peers as your support system, that’s the most important thing! Lately we’ve been enjoying our benchmark workouts! This month is our first month during the benchmark workouts so we’re looking forward to the next few months! We’re excited to see how far we can push ourselves for these workouts. Do you think Bootcamp has helped other areas of your life? How do you juggle all your work life, family life and at the same time find time to workout? Exercising comes quite naturally to us. Our kids understand the need for it too. We also try to shift things around to maintain that work life balance and at the same time find time to exercise. It’s just all about making time. Any message for couples out there who have always wanting to workout? We think being a couple could really benefit you when it comes to exercising. Your spouse is your best support system. Everytime we workout together, we’re constantly teasing each other because we feel that it drives us to push harder. So come join us in the bootcamp classes! It’s quite rewarding.